Funeral service will be held at 2:00PM on Saturday October 27, 2018 at the Glencross Mennonite Church. Viewing will be from 1PM-6PM on Friday at Wiebe Funeral Chapel, Morden and at the church prior to the service. Interment to follow at the Glencross Mennonite Church Cemetery. Donations may be made in Jake's memory to Back to the Bible Broadcast. 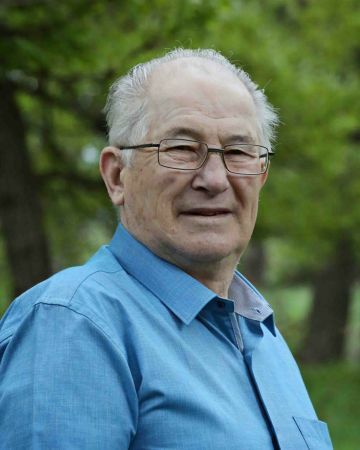 On Wednesday, October 24, 2018 at Boundary Trails Health Centre, Jake E. Hiebert aged 77 years of Morden, MB went to his eternal rest. Left to mourn his passing are his children: two daughters, Heather and Richard Dyck (Tyrell, Kara) of Schanzenfeld, Janice Hiebert of Winnipeg; three sons, Vic and Lenore (Renee, Kyle) of LaSalle, Don and Carole (Brady, Nate) of Winkler and Stan and Rachel (Rylan, Parker, Aubree) of Winkler; as well as two sisters and two brothers. He was predeceased by his wife, Betty Hiebert (nee Hoeppner) in 2006, one brother and one brother-in-law. Jake was baptized upon the confession of his faith as a young adult at the Winkler Bergthaler Church. He married Betty Hoeppner on July 9, 1967 and they celebrated 39 years of marriage before her passing. Dad was hardworking and enjoyed life on the family’s hobby farm. He was employed at several businesses throughout the years, until his retirement in spring of 2006. Upon retirement, he filled his time with many woodworking projects in his garage. He especially enjoyed preparing items for the church mission sale and creating toys and other smaller household items. From 1980-1982, Dad and Mom served together on missions in South Korea with the family. Dad was involved in many different capacities at the Glencross Church. He was a people person, and really enjoyed his years as a church usher. After retirement, the Morden Men’s Prayer Breakfast was a highlight in Dad’s week. Funeral service at 2:00 p.m. on Saturday, October 27, 2018 at the Glencross Mennonite Church with interment at the Glencross Mennonite Church Cemetery. The family would like the express their sincerest thanks to all the staff at BTHC for the excellent care Dad received. If friends so desire, donations may be made in Jake’s memory to Back to the Bible Broadcast Box 10 Winnipeg, MB, R3C 2G2. We send our love to Jake's children & grandchildren. To know that he is in the arms of Jesus & we will see him again some day is a true blessing! We will be with you in our hearts as we can't make it to the funeral. To Vic, Don, Heather, Stan, Janice and all your families. We have been thinking of you the last few days and are praying for God's peace and comfort for you. We express our sincere condolences to your family. You are in our thoughts and prayers. Words cannot express my sadness. May the comfort of God help you through this difficult time. I'm sorry I can not be there to remember Uncle Jake with you. Hugs to you all! Don and Carole...please accept our deepest condolences. So sorry for your loss! Praying for God’s presence to be your guide during time! !